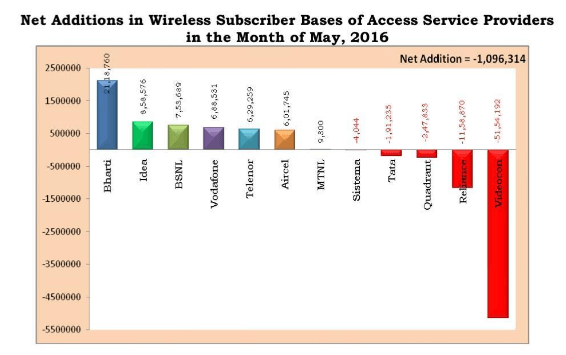 Telecom regulatory authority of India has revealed the subscription data for the month of May 2016. As per the report, the telecom subscriber base declined by 1.26 million in May to 1,058.03 million after Videocon shut its wireless operations across six circles and Reliance Communications disconnected CDMA customers who have not upgraded to 4G. In May, both wireless & wireline customer base saw a decline. Wireless customer base fell from 1034.26 million at the end of April to 1033.10 million at the end of May while Wireline category lost 0.16 million customers and we now have only 24.87 million wireline customers. The wireless customer base was mostly hit by Videocon Mobile service closure as they sold their entire liberalized spectrum across six circles to Bharti Airtel. Though Videocon continues offering GSM services in Punjab along with its CDMA counterpart Quadrant. On the other hand, Reliance Communications has closed millions of CDMA connections as they upgraded to 4G. Though, the disconnected subscriber figures are comparatively low for the company as most of the subscribers opted 4G upgrade or switched to other operators through MNP. 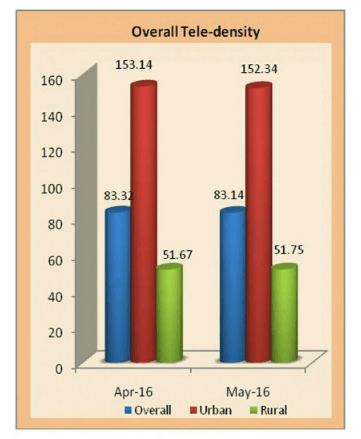 The overall Teledensity in India declined from 83.32 at the end of Apr16 to 83.14 at the end of May-16. The Urban Teledensity fell from 153.14 at the end of Apr-16 to 152.34 at the end of May-16, whereas the Rural Teledensity increased from 51.67 at the end of Apr-16 to 51.75 at the end of May-16. The share of urban subscribers and rural subscribers in the total number of subscribers at the end of May-16 was 57.18% and 42.82% respectively. Though Rcom & Videocon lost millions of customers it was mitigated to some extent by customer addition by Bharti Airtel, Idea Cellular, BSNL, Vodafone, Telenor, Aircel, and MTNL. Bharti Airtel led the chart by adding 2.11 million new mobile customers. It was followed by Idea, which added 8,58,576 customers, BSNL ranked third by adding 7,53,689 customers, Vodafone got 6,88,531 new customers, Telenor seen maximum growth in net addition by 1.20 percent and added 6,29,259 new customers, Aircel added 6,01,745 customers thanks to its performance in some key circles and MTNL got only 9,300 customers in their two metro circles. Sistema’s local unit MTS, TATA Docomo & Videocon’s Punjab unit Quadrant are the operators who have seen negative growth. 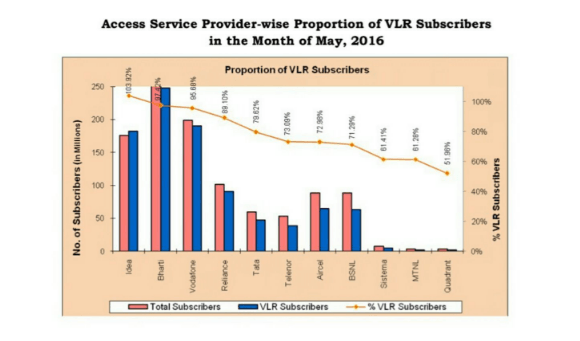 According to latest VLR data, out of the total wireless subscriber base (1,033.16 million), 932.51 million wireless subscribers were active on the date of peak VLR in the month of May-16. The proportion of active wireless subscribers was approximately 90.26% of the total wireless subscriber base. As on 31st May 2016, the private operator’s held 91.11% market share of the wireless subscribers whereas BSNL and MTNL, the two state-run operators, had a market share of only 8.89%. 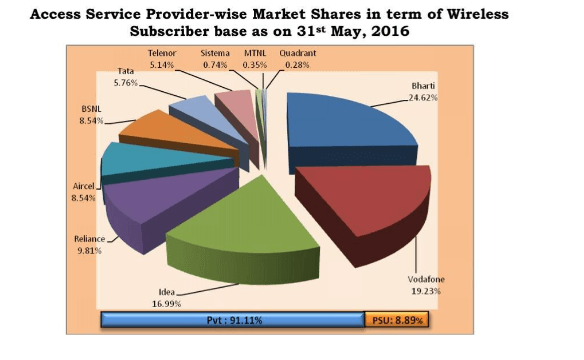 The graphical representation of access service provider-wise market shares and net additions in wireless subscriber base are given below. In May, 5.23 million subscribers submitted their requests for MNP. Compared to past months the figure is higher as many Videocon & RCom CDMA customers have ported their numbers to keep them active. Even after offering free night calls, Wireline subscriber base declined from 25.04 million at the end of Apr-16 to 24.87 million at the end of May-16. The net decline in the wireline subscriber base was 0.16 million with a monthly decline rate of 0.64%. Bharti Airtel, Vodafone, Videocon’s Punjab Subsidiary Quadrant added most of the Wireline customers. Tata & Reliance Communications saw a flat growth while Sistema’s MTS, BSNL & MTNL continued to post negative growth. A total number of broadband subscribers increased from 151.09 Million at the end of Apr16 to 159.76 million at the end of May-16 with a monthly growth rate of 5.74%. Top five broadband service providers constituted 84.32% market share of the total broadband subscriber base at the end of May-16. These service providers were Bharti Airtel (40.80 million), Vodafone (31.55 million), Idea Cellular (25.70 million), BSNL (20.76 million) and Reliance Communications (15.91 million). The top five Wired Broadband Service providers were BSNL (9.89 million), Bharti Airtel (1.79 million), MTNL (1.10 million), ACT FiberNet (0.99 million) and YOU Broadband (0.55 million). While in the wireless broadband category, the top five service providers were Bharti Airtel (39.01 million), Vodafone (31.54 million), Idea Cellular (25.69 million), Reliance Communications (15.79 million) and BSNL (10.87 million). Well not really! It is probably awesome in quite a few circles, good and on par in others and in some it gets trumped by others, usually Vodafone and/or !dea You will find many who would endorse Airtel in Telengana & Andhra Pradesh, Karnataka, Delhi, Rajasthan, Bihar & Jharkhand but not many in Chennai, Tamil Nadu, Gujarat, Kerala and Maharashtra, while it is quite all right in others such as Mumbai, Kolkata, Himachal Pradesh, Assam. Airtel the company that introduced F*UP Policy to fool customers. Shutting down of smaller operator Videocon is discussed here but even after 2 months, shutting down of TATA CDMA Mobile is not discussed. I posted 2 images regarding clouser of TATA CDMA network in some cities (not full circle) but Telecomtalk seems to be busy in Reliance Jio’s launch date & shutting down of Reliance CDMA network.